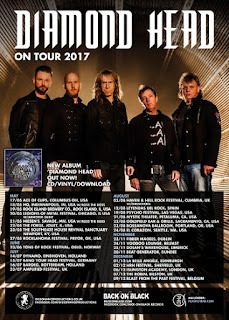 Few metal bands have been as influential and have had the longevity as Diamond Head - listed as a major influence by two of metal’s biggest, Metallica and Megadeth. Led by co-founding member/guitarist Brian Tatler, Diamond Head will be launching a North American tour that will include both US and Canadian dates, beginning on August 19th with Psycho Las Vegas festival appearance and ending on September 11th at Saint Vitus in Brooklyn, New York. “We are excited to get back to North America and see our old friends once more,” says Tatler and Wilcox (who resides in the US). 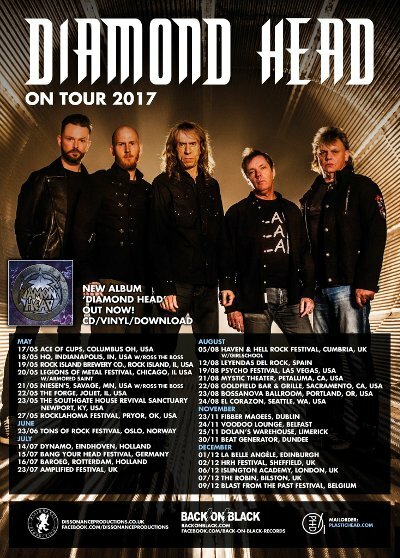 “Diamond Head may not have toured the continent as much as we would have liked way back when, but we are certainly making up for it now! And the band sounds better than ever,” states Brian. As part of the New Wave of British Heavy Metal in the late ‘70s/early ‘80s, Diamond Head came up in the same scene as eventual global headliners Def Leppard and Iron Maiden. And while Diamond Head did not achieve the same commercial success as the aforementioned bands, they did influence countless subsequent musicians - especially Metallica, as it was a then-teenaged Lars Ulrich that befriended the band early on and became a major fan. Subsequently, Metallica has covered such Diamond Head classics as “Am I Evil,” “Helpless,” “The Prince,” and “It’s Electric” multiple times - on multiple platinum releases. In addition to performing these classics at their upcoming U.S. shows, expect to also hear material performed off their latest release - 2016’s self-titled offering. Plus, there is a new Diamond Head album already in the works (set for release next year).